Caffeinated Coffee was originally conceived of simply as a demo to send out to folk clubs in search of engagements. Since then the award-winning recording has received praise from guitar aficiandos around the world. 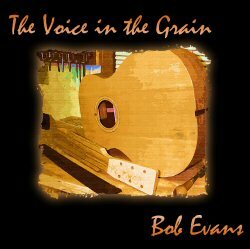 The album features 7 original compositions by Bob Evans, along with his arrangements of tunes by Lennon and McCartney, Ray Bell and Joel Fafard, and his cover of two fingerstyle guitar classics: Leo Kottke’s Bean Time and Tom Rush’s Rockport Sunday. "Evans has a strong sense of melody in his playing, and he can sketch a story with a tune, . . . This is a well-crafted solo guitar release that leaves you wanting to hear more"
"… a veritable blooming, a wellspring of artistry and riveting fingerstyle conceptions." Posted on September 25, 2008 by Bob. The song is On the Tip of the Tongue recorded at a recent concert in Saskatoon (… Saskatchewan … Canada ). It’s not a flashy, wowza!, showstopper; just a quiet little piece that means a lot to me. For the guitarists out there, click here for a transcription of this piece. This entry was posted in Featured News, News, Transcriptions, Video and tagged Featured News on September 25, 2008 by Bob. I love the melody to this traditional song. This is my arrangement inspired by Martin Carthy’s classic rendition. There is a more common version of this tune which is somewhat prettier and more melancholy. But I’ve always felt Carthy’s more aggressive musical reading of it, especially given the nature of the confrontation, seems more appropriate. This entry was posted in Acoustic Tonic Music Store, Transcriptions on July 20, 2008 by Bob. Over the years I’ve spent hundreds of hours learning guitar pieces written by other people. So it’s been somewhat humbling to have so many people learn this particular piece of mine. To set the mood, imagine lying looking up at the stars on a a hot, humid night. This entry was posted in Featured Transcription, News on July 20, 2008 by Bob.